Wilbur Cross coach Travis Gale was standing inside Coxe Cage on Saturday. His team’s performances at the Yale Track Classic were on his mind. Social media was not. Suddenly, here comes Casimir Loxom. And while the various GPS applications indicate State College, Pa., lies 315 miles from New Haven, never was the Penn State-Wilbur Cross bond pulled any tighter. 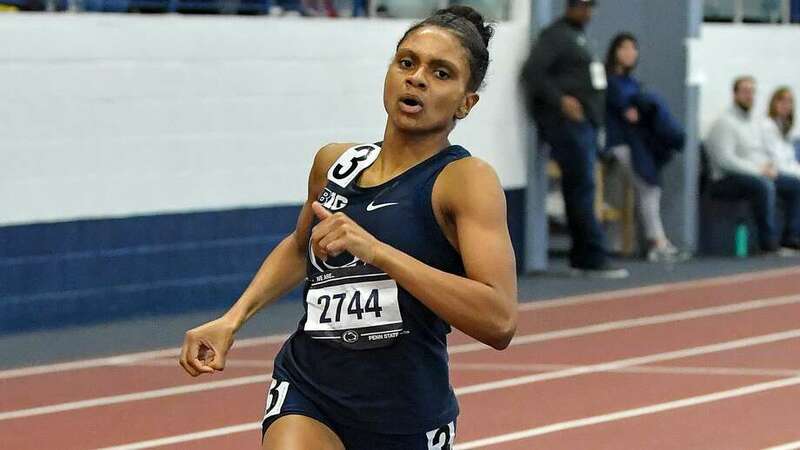 Danae Rivers had shattered the NCAA indoor record in the 1,000 meters by more than two seconds at the Nittany Lion Challenge. So here was Gale, who coached Rivers at Wilbur Cross, left with his mouth agape. And here was Loxom, the former world record holder in the indoor 600 meters. Like Rivers, he was a star at Wilbur Cross and a star at Penn State before retiring from the sport in October at age 27. Success is not new for Rivers. She was a wunderkind. By 10, she’d won a Junior Olympic national title. By 12, she had set two national age-division records. By the time she had committed to Penn State, she was well on her way in 2016 to becoming the first three-time recipient of the New Haven Register Athlete of the Year award. Rivers claimed multiple state titles and still holds the Connecticut high school records in the 800, 1,000 and 1,600 indoor and 800 outdoor. Everyone expected success to follow her those 315 miles to State College. The question, of course, was how much success? On Saturday, she opened her junior indoor season with the most resounding answer yet. Her 2:38.58 victory eclipsed the 1,000 record of 2:40.7 set by Kaela Edwards of Oklahoma State in 2017. “First race of the season I didn’t quite know it was going to set up that well for me to run that time, but I had one of my teammates, Grace Trucilla, rabbit me,” Rivers said. “She paced me through the 600. From there, I took it alone. Rivers took third regionally and 87th nationally in the NCAA cross country championships last fall. She is not your typical distance runner. She transitions to the middle distances in track. That means more speed, more leg turnover. John Gondak, Penn State cross country and track coach, is admired as a premier middle-distance mentor who can help runners peak more than once during a calendar year. Once cross-country ends, she shuts it down for a week or so before slowly rebuilding her endurance and then getting into track workouts. Rivers breaks into a laugh when asked what her goals are this season. After all, she just became the first woman in college history to break 2:40 in the 1,000. Rivers took eighth last year in the 1,500 meters in the NCAA outdoor championship with a time of 4:12.36. She took seventh last year in the 800 indoors at 2:04.2. The NCAA does not hold the 1,000 in its national meet. “I always knew what a hard worker Danae was in high school,” Gale said. “The whole state did; we knew she would be successful. She’s really humble and has had great parental support. I don’t want to say I’m shocked, but it’s amazing she’s doing these things as a young adult. If you think going from cross country to a middle-distance runner is a bit of a crossover, consider Rivers’ academic pursuits. She designed an integrated arts major with the goal of becoming a medical illustrator. A medical illustrator, Rivers said, can work in hospitals with doctors and use art to help explain complex medical procedures to patients. Or you can study among scientists and portray their research. Or you illustrate for anatomy books. Sketches, paintings, three-dimensional visuals — it’s all part of it. “I was influenced by both my grandmothers when I was young and I kept the art aspect of me on my journey,” Rivers said. That journey included traveling 1,000 meters faster than any female college athlete in history. Exhausted, she celebrated by hanging out with friends and watching the NFL playoffs. Back in New Haven, Gale and Loxom were keeping track and pulling for her. Gale said his team follows Rivers. Loxom returned to Penn State for a time last year and helped out coaching. And on Saturday that bond spanned 315 miles in two minutes, 38 seconds.